May Hogue talked recently about her work on the town's Earth Day Committee. 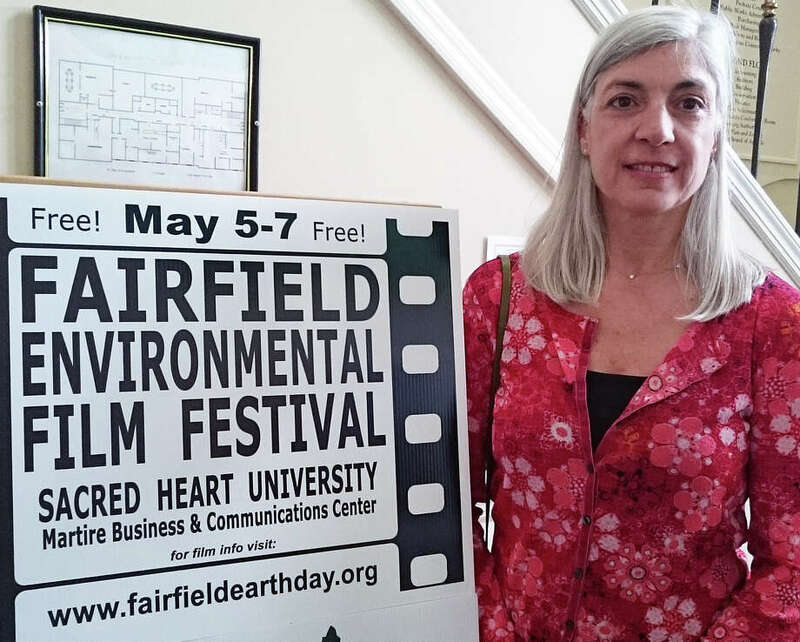 FAIRFIELD — Mary Hogue had never attended the town’s annual Earth Day celebration prior to joining the committee planning the environmental event in 2012. But Hogue has since been involved in a variety of “green” causes. Not only is Hogue the chairwoman of the Earth Day Committee, she also chairs the Fairfield Forestry Committee. Hogue is the education and outreach manager for the North American Marine Environment Protection Association; vice chairwoman of Fairfielders Protecting Land and Neighborhoods, and a board member and project manager for the Mill River Wetland Committee. Her resume includes serving on the Connecticut League of Conservation Voters, and as a board member of the Fairfield League of Conservation Voters. Hogue has put in time in various roles on local PTAs and has a BS in art education from Penn State University. She also holds master certifications in composting and gardening, as a naturalist and is a graduate of the Maine Composting School. A native New Yorker, she moved to Fairfield in 1996. Hogue took time to talk with the Fairfield Citizen about the local Earth Day observance Saturday, and protecting the environment. Fairfield Citizen: What first sparked your interest in the environment? WHEN: Saturday, 10 a.m. to 4 p.m.
WHERE: Fairfield Warde High School, 755 Melville Ave.
WHAT: The town’s Earth Day celebration will feature a variety of vendors, along with family activities, live music and food trucks. Features include a question-and-answer session with Fairfield state legislators at 11:30 a.m.
Attendees will be able to recycle electronics at the event — televisions, computers, cellphones and small appliances can be brought to the Knapps Highway side of the parking lot for disposal. Baystate Textiles will also be collecting clothing, footwear, accessories and linens for recycling. Mary Hogue: Growing up in New York City and coming out to this part of Connecticut to spend the summers was probably what started my interest in the environment. I grew up in the late ’60s and ’70s, and it was a time of focus on the environment. It would have been hard to not have been made aware of environmental issues growing up at that time, especially in New York City. And then coming to Connecticut for the summer showed the vast difference between the urban and suburban/rural existence. FC: What do you think is the most important step an individual can take to help the environment? Hogue: On the Fairfield Earth Day Committee we have two principles that we aim to adhere to: 1) “There is no right way to be environmental aware and take action” — whatever works for you is the right way for you. It’s different for everyone, and it often changes over time for folks. 2) Each of our endeavors must meet the triple bottom line of people, planet and profits to be sustainable. We want our committee’s efforts, and the efforts folks take, to continue, to be sustained. In order to do that, it needs to be reasonable to do for people. If we can help to connect people and build community and new relationships, we love that and work hard to make that happen — that’s part of the big Earth Day Celebration we host every year in April. FC: How have Earth Day celebrations evolved? Hogue: Over the past few years, we’ve come to realize that one day is not enough — we wanted to make it possible for folks to connect to our ideas and message throughout the year and started to build alliances with other town committees, organizations, groups, the religious community, build stronger ties with the schools, especially because the youth of today are really the ones that are going to have to deal with the issues we create today. Through these collaborations, we’ve helped the Bike-Walk Committee with their Library-to-Library and Shoreline bike routes, we’ve worked with the Clean Energy Task Force to put on the first and planning for the 2nd annual Electric Vehicle Showcase on Sept. 10 in the auxiliary commuter lot across from the Rec Center ... As well as being instrumental in promoting the first and second (current) Solarize Fairfield program, we work with the Solid Waste and Recycling Commission and have scheduled field trips to facilities that manage our waste stream and provide materials to help Fairfield citizens to learn about the single-stream recycling program, which actually saves them tax dollars because we get paid for our town recycling. In fact, according to (First Selectman) Mike Tetreau, we save $2.4 million a year on alternate fuel for town resources, which translates into a 1 percent tax decrease thanks to the town “going green” by managing resources in smart way. We helped to coordinate a town vigil last December at St Paul’s Church on Old Post Road in support of the UN’s COP21 Climate Change talks, and have forged a strong alliance with the Fairfield Town Clergy Group, a group of Fairfield clergy leaders of all faiths that have met and coordinated efforts for many decades to help spread the word about healthy lifestyles. We work to support the great work the Fairfield Health Department does in support of healthy lifestyles through healthy eating, exercise, and getting out and enjoying nature. We work with the Fairfield Forestry Committee, Connecticut Audubon Society and the Aspetuck Land Trust to help folks understand all the wonderful resources available to them in Fairfield. We work with FairPLAN, a group that supports protecting land and neighborhoods; the Conservation Department, Shellfish and Harbor commissions in their work to protect our natural resource, the health of our land and thus our own health. We are proud of our Mill River Wetland Committee enjoying their 50th year of supporting a healthy environment for our town and teaching our school children the science behind it all via their River-Lab program. Our proudest work together has been the clean up of the Mill River from the contamination of lead from the Exide battery plant. As you can see, we think every day should be Earth Day, and our event really is a celebration of all the wonderful things we have to enjoy here in Fairfield and all the wonderful people that help to keep these areas safe and healthy for all of us. And as you can see, we see everything can relate to Earth Day’s sense of health, fitness and fun. Building community and finding the ways we can work together is what the Fairfield Earth Day Committee is all about. We’re especially proud of our student volunteers. For instance, Sarah Magee joined us as a junior at FLHS and because of her we have our annual art contest, where we get 100-plus entries. Emma Gleysteen has been our chair the past two years. Theo Hurley, a senior at FLHS is our volunteer coordinator, recruiting and managing the 100-plus students we get to volunteer every year, without their help we would not be able to put on the Fairfield’s Earth Day celebration event. And new this year is the 1st annual Fairfield Film Festival May 5-7 at Martire Business & Communication Center at Sacred Heart University. FC: What is your favorite part of Fairfield’s Earth Day celebration? Hogue: The real answer— my favorite part is when it’s over, because it’s one day that takes a lot of work. And then, after a little rest, we get back to meeting and coordinating with all our old friends and making new ones to do even more fun, cool things. Our ‘Trashy Fashions’ show is a perennial hit, and we’ve now made a great alliance with Lauralton Hall, while continuing to work with the Roots & Shoots club of Burr Elementary to put on a sassy, fun, but provocative show that makes folks think about how to make more and better use of our resources. We have been told we should call ourselves a music festival because of all the wonderful live music we have throughout the day in the many venues at the event. We’ve expanded the number and variety of food offered by our food trucks, and folks rave about the fare. The hour with the federal and state legislators, where they listen and the audience — usually close to 100 people — get to ask their representatives questions and hear their thoughts have inspired many people. There really is something for everyone at Fairfield’s Earth Day Celebration. FC: What are your feelings on United Iluminating’s tree-trimming program? Hogue: Funny you should ask that question, as I just met this morning with a group of people regarding a report from UI. The Fairfield Forestry Committee is a dedicated group of volunteers working with and in support of our wonderful tree warden, Jeff Minder. We do feel there is a need for pruning and removal of trees along the public right-of-way as well as on private property that has not been done for a while, so getting to this much needed maintenance is great. But going beyond what’s needed is not only detrimental to the aesthetics of our town, trees are an important part of Fairfield’s cultural heritage and identity. There is also science to show that taking down too many trees can make the remaining trees more susceptible to damage from storms, and therefore end up doing the very opposite of what the tree trimming program is meant to do. It’s nuanced, and not a one-sized-fits-all process, though that’s how the legislation is written. We need to work with the utilities to be intelligent about how to best manage our trees, not blindly follow rules that oversimplify the situation. Those rules were meant as general guidelines, not as edict.